Hot Weather Bringing Out Stinky Smells? Summer is upon us and with hot weather usually comes stinky smells! Sometimes odors can surface from dog runs, urine saturated concrete, closed up rooms and more when it is hot out. 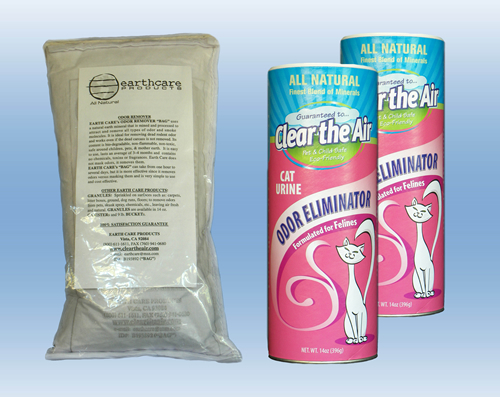 We have lots of customers who use our Pet Odor Eliminator on concrete floors and carpets during the hot months of the year. All you have to do is simply sprinkle granules on the area where odor is the strongest. Vacuum or sweep up the granules after 24 hours and the odor will be gone! If you have any artificial or even real grass that your pets frequently use for the restroom, our Odor Eliminating Bucket can be sprinkled directly on the grass to eliminate any foul odors. This is a great alternative to sprays that will kill your grass and can be harmful to pets. Clear the Air is safe even if ingested so you don’t have to worry about any harmful side affects to your pets or children! 1. Hang an Odor Remover Bag in each trash can. 2. Hang an Odor Remover Bag over the trash cans. 3. Sprinkle 1/2 cup of Odor Eliminator granules on the bottom of the trash can. 4. Add more granules on top of trash as needed.